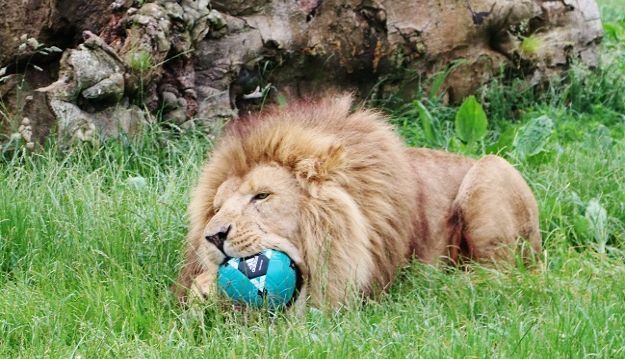 The lions of Longleat are throwing their considerable weight behind England ahead of their round of 16 game against Iceland on Monday night. 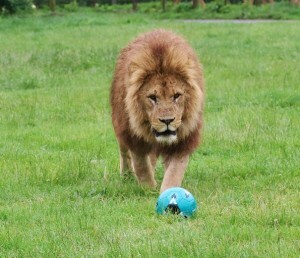 In 1966, the year Longleat Safari Park opened, England’s mascot was a lion called World Cup Willie; now 50 years later keepers at the Wiltshire attraction are hoping their 2016 version will help England win the UEFA European Championships. Male lions Simba and Klaus and female Nyota demonstrated some enthusiastic, if not entirely successful, dribbling skills as they grappled with a trio of footballs. Longleat’s Ian Turner said: “They were clearly extremely keen to show their interest and passion for the great game. “Unfortunately this enthusiasm did rather get the better of them and they ended up puncturing every one of the footballs in the space of a few minutes. “Hopefully the team will be able to keep hold of the ball a bit longer and look after ot a bit better on Monday night,” he added. Today it is difficult to imagine the furore aroused when Longleat’s plans for an initial 100-acre lion reserve were made public back in 1966. There were warnings of big cats running wild in the Wiltshire countryside, clergymen were up in arms and there were even questions asked in the Houses of Parliament. In spite of the fears however the ground-breaking concept of the drive-through safari park, aided perhaps by the storm of publicity, proved hugely popular.Fifty years on, Longleat remains one of the country’s leading wildlife attractions and continues to be at the forefront of zoological innovation.